The chances are that you have at least one refrigerator in your home! Usually, not only most of them can serve you for a long time, but you probably will not have any serious problems with the good devices. And even if you do, solving the problem is something that can be done quickly. Of course, only if you put your trust in the best fridge mechanic! Do-all Appliance Service has been in the business for over a quarter of a century. During that time, the company has built a reputation as on the best choices when looking for a refrigerator mechanic and fridge repair. Each member of Do-all team has the equipment and the knowledge needed to fix any issue with any kind of refrigerator. But, so do other fridge mechanics – you might argue. So why choose Do-all Appliance Repair Service? Thousands of people hire us each year. It’s guaranteed that our skilled team will find a solution to any problem you might have with your Whirlpool fridge. But, it’s not just about this brand of refrigerators; we also have the expertise to deal with all types of fridges, like Fisher & Paykel or Westinghouse, for example. These are some of the most common problems the people from all over Australia have with their fridges. But, even if the issue you’re having is not on the list, there’s not need to despair. All you got to do is give a call Do-all Appliance Service and our mechanics will come over and make the problem disappear. Although our services are not expensive and we deal with the problems in the shortest amount of time, it doesn’t mean you want your fridge to get broken often. In order to prevent fridge problems from happening, there are certain things you can do. The good news is that there are a lot of good refrigerators, that do not require extensive maintenance. It’s enough just to check on it from time to time and make some adjustments, if necessary. One of the things that it’s important to check is whether there’s enough space behind the fridge for the ventilation to work properly. Also, you need to pay attention to where the closest heat source is located. It needs to be further away from the fridge; as otherwise, the fridge will have to work much harder in order to lower the temperature inside. Another good piece of advice is to let the meal leftovers cool down at room temperature, before putting them in the fridge. The advices above are just a few of many that can prolong the life of your refrigerator. 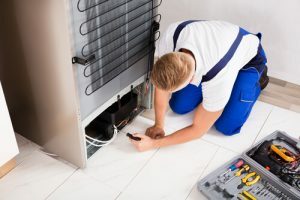 If you need more tips like these, feel free to ask Do-all Appliance repair Service for everything related to refrigerators or any electric appliances repairs and services.